You know those gym rats who go to the gym 24/7 and then they have to have surgery or something and their doctor tells them that they can’t work out for a few months and they just DIE inside? That was us with engagement sessions and weddings for the past two months. Only a doctor never told us not to and we never had surgery. But we did have crazy cold weather and lots of dead foliage. Needless to say (and ending our nonsensical rant), last night’s Greenwell State Park engagement session gave us LIFE again!! The PERFECT way to end the week and start of a beautiful weekend. Tony and I have known Brandi for a few years now. We first met at New Life Church when a couple 20-somethings decided to get together and create a place for other 20-somethings to get together, have fun, and praise Jesus. This group is now called Impact and it’s grown so much since we were just a small group of 8. Meeting Ray for the first time this session was awesome because we just couldn’t imagine who would be worthy of sweet Brandi’s heart – and now we can totally see how Ray has stolen the show. Last summer, Ray had proposed in front of Brandi’s entire family at their gender reveal party for their sweet baby boy, Timothy! Jesus had called sweet Timothy to heaven a few months later, but this only grew Ray and Brandi’s hearts closer together. No one prepares you for the loss of a child, but we are so thankful that Ray and Brandi have a close relationship with Jesus. There is a reason Jesus said he is our comforter and counselor. He works through us in ways that only he can. Ray kept asking to go to the court house and get married, but Brandi wanted to wait until after she finished her bachelor’s degree to plan a traditional wedding (you go, girlfriend!!). 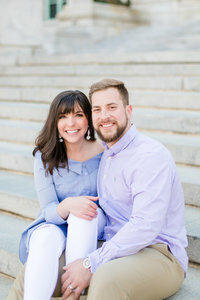 We are just counting down the days until their wedding this May!! It’s going to be a beautiful spring ceremony and celebration, and we are beyond excited about being a part of the day!! God has amazing plans for them and we can’t wait to witness it! To view more sessions at Greenwell State Park, browse the links below!